I love the lifehacks people, but sometimes I think a quest for efficiency and the perfect creative environment is just another excuse for procrastination. That thought was confirmed when I read this quote from the composer Morton Feldman in a 6/19/06 New Yorker profile (emphasis mine). "Earlier in my life there seemed to be unlimited possibilities, but my mind was closed. Now, years later and with an open mind, possibilities no longer interest me. I seem content to be continually rearranging the same furniture in the same room. My concern at times is nothing more than establishing a series of practical conditions that will enable me to work. For years I said if I could only find a comfortable chair I would rival Mozart." You and me both, Morty. time 2006.06.25 / link / comment? If I were king of Texas, all non-essential services within 100 miles of Austin would shut down this week. Especially Internet startups with offices so close to Sixth Street that you can smell the guitar grease. time 2006.03.16 / link / comment? As I was addressing a stack of my xmas CDs, stamping them with Isamu Noguchi stamps and wondering whether I had a snailmail address for Chandrasutra, I was struck that the middle stamp reminded me of something I couldn't quite place. 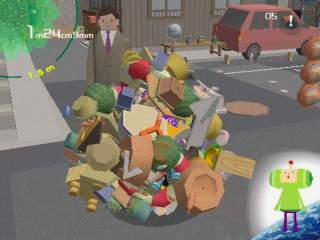 Then I had it: Katamari Damacy! I got this in an autoreply e-mail message the other day. No internet, telephone, energetic or physical associations will be permitted -- sands have frozen. All soulular children and associations are lovingly released to tread their paths of each individual directive. Please do not attempt to contact me. My apologies for any inconvenience you feel this may incur in any way. And while I'm on the subject, here's my latest favorite spam teaser. Subject: Give the awesome goodie of time! As any of you who've been paying entirely too much attention to my sidebar have noticed, I've started a second blog. It chronicles among other things my return to school after ten years away, of which today was my first day. It's intended to be more technical in orientation but will take some detours into curmudgeonry and the usual obsessions of Austin bloggers. Oh, and it may even help you find a job. time 2005.01.19 / link / comment? You'd think these guys were still dealing with paper checks. Hauled by oxcart. Can I pass a comment on to the management of Wells Fargo Online Banking? Today I downloaded my account history for the first time in a while and was disappointed to see that the available history covered only the span of 7/9/04 through 9/20/04. I don't see any reason why you can't provide me with the entire history of my account, or failing that, at least a full year. That's the necessary amount of data to get a proper financial picture. At a bare minimum I'd have expected to get a full quarter's history. Just how often do you think the typical Wells Fargo Online Banking customer can find the time to sit down and reconcile his or her account? I've asked about this before and been given an excuse about how data is periodically cycled out of the system. I work in IT and I know that we're not talking about vast amounts of data here, that its organization is straightforward with few issues of scale, and that disk space gets cheaper all the time. Even in uncompressed form my account history doesn't take more than 100K per year. Nowadays free services that I don't pay a cent for allot me up to ten thousand times that much storage! Again, I would appreciate it if you would forward this message to your Online Banking management. Thank you. If there are any other Wells Fargo customers out there who'd like to send them a clue, feel free. The Contact Us link on their website would be a place to start. Let me know if you figure out how to reach an actual human. I suppose now would be a good time to inquire about U.S. banks operating nationwide which do a better job of integrating their free online banking with money management software like Quicken. It does occur to me that Wells Fargo may do a sucky job because they want to encourage people to trade up to their paid online banking, not a smart policy if we have the option of trading up to a different bank. However, I chose Wells Fargo in part for brick-and-mortar reasons, so there are other constraints that might keep me from switching. Sigh. A while back Caterina blogged about her sense of her finite capacity for knowledge. Try as one might, try as I might, that is, I cannot cram more understanding, more thinking, or more knowing into this pre-ordained or self-limited Knowosphere. I don't really believe that my mental capacity is a zero-sum game, but I do have the sense that storage costs more than it used to. I may be mixing up two loosly connected things here, "knowledge" and "memory", that is, a set of usefully-organized information and related skills vs. a collection of experiences and the related feelings and fact(oid)s around them. But I do feel very strongly the old idea that time moves more quickly as I age. Actually, that's misstated, too. I think a minute can be long or short whether you're 2 or 92, as in Einstein's old saw about the hot stove and the pretty girl. But the memory of time gets drastically compressed as one ages. My hunch is that that has less to do with brain capacity than with the fact that new experiences more readily make memories than old, familiar ones. I know that my ten days in Brazil last January loom much larger in my memory than the ten days before or after and the first weeks after each of my daughters was born seem like years. If I'm right, then maybe seeking out new experiences is a way of fighting back against the time-shrinkage idea. And if memory and knowledge are more tightly connected than I think, perhaps it would work against the zero-sum Knowosphere model as well. This all comes up because of a forthcoming book I spotted while browsing Amazon's Early Adopter Store. The book is Why Life Speeds Up As You Get Older: How Memory Shapes Our Past by Douwe Draaisma and Arno Pomerans. I hope I remember to watch for it when it comes out in October. Over at Reenhead we were discussing Sturgeon's Law, that 90% of everything is crap. What I've always wanted to know is, does Sturgeon's Law work recursively? Take a million jelly beans and remove the 900,000 that are crap. Are you left with 100,000 good jelly beans or are 90,000 of those crap as well? And so on. How to Make a Complete Map of Every Thought You Think is an e-book on using your Moleskine to freeze your brain in its tracks. For all of this immobility, this freezing, for all of these negative effects, why on Earth would anyone want to do this? Because of the INCREDIBLE CLARITY that comes with it. It may feel like, doing this, that for the first time in your life, you REALLY have a CLEAR IDEA of what kinds of thoughts are going through your head. You'll really understand your ideas. And you'll also see connections that you were never consciously aware of before. You'll see a structure and a pattern in your life. You're goals and psychology will become clearer to you. You'll be clearer too about what you do NOT understand. It goes on like this for 131 pages. I can't figure out whether this is strictly a tinfoil helmet or the guy is onto an interesting cognitive science experiment. Or a cheap alternative to analysis or acid. Or at least a nonfiction version of NaNoWriMo. In other notebook-obsessive news, there is now a group blog for Moleskine users: Moleskinerie. I've always heard that Pepto-Bismol can help settle an upset stomach but any time my stomach was bad enough to need it, the obscenely pink liquid looked so vile that drinking it would surely trigger just the response I was trying to prevent. Well, one of my girls spent last night throwing up and I've got a premonition that could be me tonight. So I screwed up my courage and am dosing myself with the stuff. And you know what? It's not as bad as it looks! I wish I'd tried it years ago on a sound stomach so I'd have been used to the idea all the times I needed to take it for a queasy one. It's not a good idea to try to blog while fixing a grilled cheese sandwich. I had my own Queer Eye for the Straight Guy moment this weekend and invited some friends over for a proper grown-up dinner which I cooked myself. You know, part of the QE makeover formula is for the SG to entertain, something we straight guys are apparently impaired at. I know I fit the profile so, silly as it may seem, the evening was a bit of a milestone for me. With both carnivores and herbivores on the guest list I did two kinds of lasagna, a red lasagna with Italian sausage and a green lasagna with pesto and spinach. Those recipe links are there because the guests were kind enough to ask for them. Thanks, friends, for being an appreciative audience for this little baby step of reinvention. 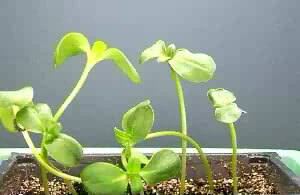 Roger Hangarter of IU has put together a wonderful site for time-lapse video of the movements of plants. We all know from elementary school about plant tropisms (e.g., phototropism, gravitropism). But I knew very little about nastic movements ("plant movements that occur in response to environmental stimuli but unlike tropic movements, the direction of the response is not dependent on the direction of the stimulus"). For example, the twining of morning glories or the "nutation" of sunflower seedlings. It's easy to see why Hangarter's site has inspired art: Flower Play and boxtrio [beware: sound]. time 2003.10.21 / link / comment? Once upon a time I graduated from Stillwater High School.